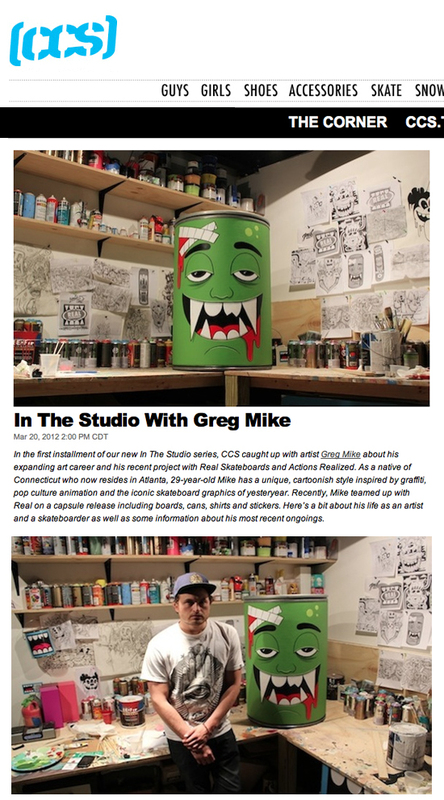 CCS gave a rang to the studio the other day to chat a few words about the most recent collabo with REAL SKATEBOARDS. Here is how it went down. Let’s start with a little bit of background. You were born in Connecticut, but reside in Atlanta? I was born in Danbury, Connecticut and moved to Florida in my teens. I ended up at Florida State University studying art and design for college and that's how I ended up in Atlanta. Since Atlanta was the largest major city closest to Tallahassee, I would head up on the weekends to enjoy the city life. I’ve been living in Atlanta for about eight years now. Do you remember being interested in art and drawing as a little kid? When and how did your career in artwork begin? I’ve been doing art since as long as I can remember. I started getting heavily involved in drawing back when I was about eight or nine years old and skating when I was twelve or thirteen. Honestly, skateboarding is what introduced me to the graffiti side of the art world. Those cultures go hand in hand. I got into writing when I was twelve and stayed into it through my mid twenties until I got more into the design and fine art aspect of visuals. What artists do recall as influences when you were growing up? When I was living in Connecticut, I was traveling to New York and remember artists like Cost and Revs who were the first guys going all city with wheat paste campaigns, rollers and bucket paint. It caught my attention as they were taking the non-traditional approach to work on the streets and really pushing the boundaries. As for graffiti, a lot of the guys from Connecticut, such as EMIT, JIVE, REM and the DF CREW crew inspired me. I've always been inspired by everything from old Disney cartoons to elements of retro pop culture that may have impacted me in some form or fashion. You definitely have a distinctive cartoonish style to your artwork. Where does that come from? Originally it derives from a lot of the graffiti elements and from doing a lot of characters work. As I moved away from the letter forms of traditional graffiti I turned more towards the characters vs. typography. It’s taking everything that inspirations me and melting and merging them all together in my brain to create something new. It’s a mix of cartoons and comics, colors, and a bit of new and old all blended together. How does skateboarding fit into the equation for you as an artist? Skateboarding has always been apart of my life. Back when I was a young and living in Connecticut and first started skating I remember buying the old CCS blank completes. Throughout my teenage years my life consisted of skating in the warm months, snowboarding in the cold months and doing artwork in the evenings. My cousin John introduced me to skating and I remember being super inspired by all the old school Powell Peralta graphics. Twenty some years down the road it's both inspiring and humbling to work with a company with serious roots like Real Skateboards. It’s very rad to see it all come full circle. That was going to be my next question. How did you originally get involved with Real for this project? Jim [Thiebaud] reached out online and shot me an email through my website. We had a few phone calls and emails back and forth and ended up collaborating on five decks total. We created two pro decks—one for Peter Ramondetta and one for Justin Brock. We then did one cruiser deck shaped like a tall boy can which resembled one of my signature MAD CANS and two team decks. We also did custom koozies, t-shirts and some stickers. It was a nice little capsule collection that represented a nice range of our what we do. What is Actions Realized and how does it tie into the overall project? Actions Realized is a charity Deluxe started with the fight against childhood leukemia. Once we started collaborating, Jim had asked if I'd be interested in doing something with the charity. I was all for it, so I took the Peter Ramondetta can I designed for the Real deck and brought it to life by painting it into one of my 3ft 3D large cans. The piece was on display at ABV GALLERY in ATL and then auctioned off on ebay with 100% of the proceeds going towards Actions Realized / Johhny Kicks Cancer Foundation. What’s your agency ABV in Atlanta all about? I started ABV almost two years ago in Atlanta. It's a creative studio that works with brands around the world on various creative based projects, a gallery and shop which showcases artwork from artists both locally and internationally and a clothing collection which will be available to the public later this year. What’s next for you? Any big projects coming up on the horizon? I have a collaboration with San Francisco-based Benny Gold which drops in April, ABV's two year anniversary and clothing collection drop, new outdoor murals and fine art pieces in the works, new shows in the gallery and new collaborations that I can't go to deep into detail about. Just continuing to expand creatively, keep traveling and hopefully keep skating!